From the third week of March until mid-May, about 90 farms in the highlands turn pink. Oman’s Al-Jabal Al-Akhdar (which means the green mountain) whose peaks vary from 7,000 to 9,000 feet high are moored high up in the central mountain ranges of Al-Hajar. It is a plethora of color, sheer unadulterated picturesque mountains and a place where fruit orchards and roses flourish. Throughout the season, rose harvest, pickers rise early to pluck the blossoms just after they open and before the day’s heat evaporates their fragrance and dew. The harvest is collected in a sheet of cloth, packed in a bundle and transported to one of many traditional extraction units set up by villagers. Rose petals are distilled at the traditional mud ovens called “Al-duhjan.” The petals are allowed to simmer gently for about four hours in a vessel called “Al-burmah,” which is covered by another vessel made of copper. As it boils, water flows from the petals into the copper vessel. The old petals are then replaced with fresh petals using a traditional tool. After boiling, the rose water is poured into a large pot known as “Al-karas,” where it remains there for at least 30 days. Then, the rose water is ready to use and is bottled and taken for sale. The majority of the 90 farms are located at Al-Aqr, Wadi Bani Habib and Al-Fiqaine villages. Roomfuls of blossoms are traditionally distilled to produce rose water in Oman’s Al-Jabal Al-Akhdar’s region. However, not much is being done to exploit its potential. “This year’s rose crop was not that good and it ended early,” said Engineer, Yahya bin Nasser bin Saif Al-Riyami, assistant director-general at the Ministry of Agriculture in Oman. 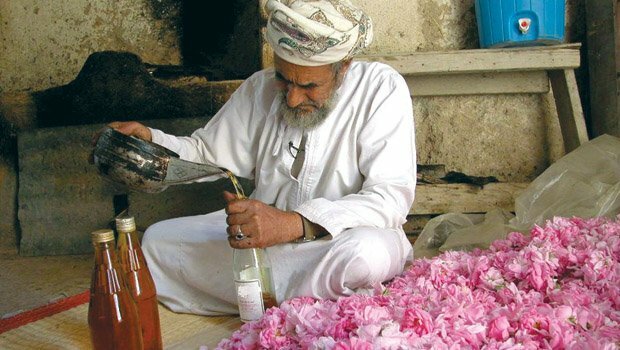 According to sources at the Ministry of Agriculture, the government is exploring investment opportunities in rose water making units in Al-Jabal Al-Akhdar whose ideal conditions make the cultivation of roses and distillation of rose water bright. They said that entrepreneurs should pool in resources and invest in the rose water distillation business. Its potential for use in exotic perfumes is also yet to be tapped. Each bush yields about 15-20kg of petals during the season, while it takes about 2kg of petals to generate 750ml of essence valued at RO5. Al-Riyami said that due to the economic value of this segment, rose cultivation and distillation have great potential and can bring in more revenue. He added that roses are one of the top contributors to the agriculture income of the area. According to some farmers, the Ministry of Agriculture has put in some efforts by providing help to promote rose distillation. However, they feel more needs to be done considering the high economic value of the product. People from the nearby Gulf regions make it a point to visit Al-Jabal Al-Akhdar to buy in bulk the rose water, which is of good quality. They also enjoy watching the traditional rose water distillation process. Rose water is used in medicinal, culinary and celebratory purposes. It enjoys wide popularity throughout the Middle East and is a must in every kitchen. It is particularly sought after during Ramadan when it is used in preparing the fast-breaking meal and during the two Eids when it is often employed as a flavoring in drinks, custards, jellies and other desserts. Rose water also offers a way to refine the socially ubiquitous glass of tea and Omani halwa. It even has a place in the preparation of traditional cosmetics. For example, black kohl (powdered antimony sulphide that is used like eyeliner throughout the Arabian Peninsula) is often mixed with rose water to make an applicable paste, which is said to aid impaired vision. An enduring whiff that breathes of long tradition, the essence of Al-Jabal Al-Akhdar ’s roses is likely to remain an evocative and timeless fragrance.